Pasha Ancient Tea Mountain is located in Menghai county to the Southwest of Gelanghe tea mountain. The highest elevation is 1850 meters, with an average of 1700 meters (the same as Lao Banzhang mountain). This certified organic Pu-erh tea was made from selected ancient arbor leaves grown on Pasha Ancient Tea Mountain. The tea features prominent silver needles producing a strong, fragrant, bright yellow tea with rich yet mellow flavor and a pleasantly sweet sensation in the mouth. 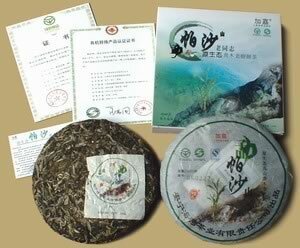 It is an excellent Pu-erh, suitable for storing, giving as a gift, or drinking immediately.